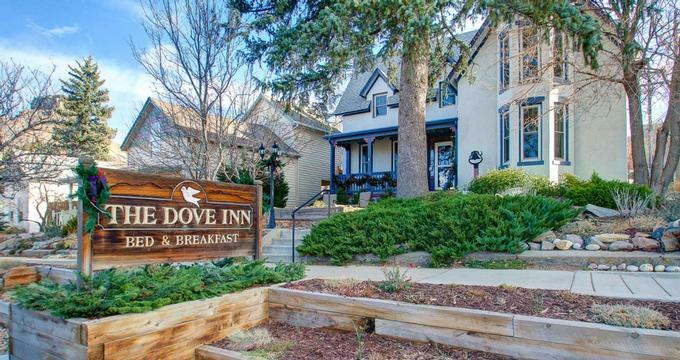 Built in 1866 and exuding the grace and charm of the bygone era of the Golden Age, the Dove Inn Bed and Breakfast is a comfortable, home-away-from-home Colorado getaway for both business and leisure travelers. Nestled in the foothills of the Rocky Mountains, the charming Victorian inn features eight beautifully appointed accommodations with contemporary décor and modern amenities, first-class facilities such as jetted spa tubs and on-demand in-room movies, delicious cuisine and inviting hospitality. The inn is located on a quiet street in Golden, offering a tranquil escape from the city, but is within walking of Golden's main street which is lined with a variety of unique shops, fine dining restaurants, cafés, breweries, taverns, galleries, music clubs, and other forms of entertainment. It is also just a short walk from the world-renowned Red Rocks Amphitheatre. The Dove Inn Bed and Breakfast offer eight exquisitely appointed guest rooms and suites, ranging from historical and luxury rooms to multi-purpose rooms, all of which feature stylish décor, king, queen or doubled beds in deluxe linens and private bathrooms with showers and/or tubs, plush towels and organic bath products. Amenities in each room include flat panel HD televisions with satellite channels, coffee makers with complimentary coffee and tea, bottled water, air-conditioning, and free wireless Internet. Historical Rooms include the Clear Creek, the Columbine, the Red Rock, and the Shakespearean Rooms, as well as the Parisian Suite. The Clear Creek Room features designer décor and linens by Kate Sommers, a queen-size bed and en-suite bathroom with shower, a work desk and beautiful views over the inn’s gardens. The Columbine Room is located on the second floor and features a queen-size bed, Victorian wallpaper, a work desk and large windows. 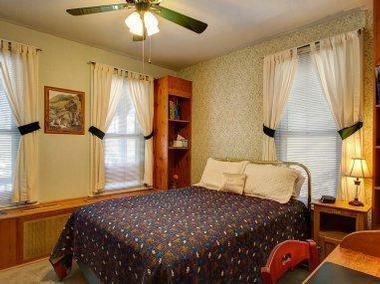 The Red Rocks Room features a queen-size bed, a private bathroom with a six-foot antique claw foot tub/shower, and a writing table. Once a lodger's room built in 1928, the Shakespeare Room enjoys a private entrance on the first floor and features a queen-size bed, a private bathroom with antique claw foot tub/shower combination and a work desk. The Parisian Suite is located on the second floor and features large bay windows and lovely views of Golden's Northern foothills. 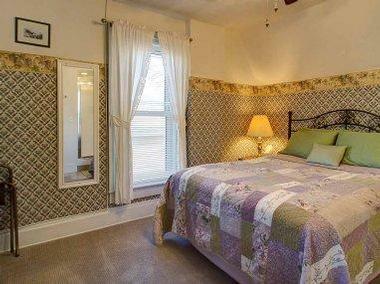 The suite offers a queen-size bed, private bathroom with shower and a work desk and chair. 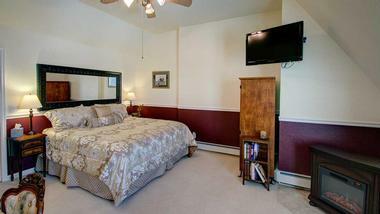 Luxury Rooms include The Aspen Suite, The Queen Anne Suite, and The Serenity Suite. The Aspen Suite is found on the second floor and features a queen-size bed and a private bathroom with a double marble whirlpool tub and shower, a spacious sitting area with an electric fireplace and romantic loveseat. The Queen Anne Suite features a king-size bed, a spacious sitting area with a large HDTV, an electric fireplace, a roll-top desk, and a sleeper sofa that converts into a double bed. The Serenity Suite features a cathedral ceiling, a king-sized bed, and a private bathroom with over-sized jetted tub for two and a shower. A lovely sitting area has a comfortable sofa that converts into a double bed and an electric fireplace. The sofa converts to a double bed. The Dove Inn serves a delicious complimentary breakfast every morning that includes house-made granola, yogurt, freshly baked pastries, and other healthy options, and hot coffee and tea. The Inn is within walking distance of Golden's main street which has a variety of restaurants for lunch and dinner. 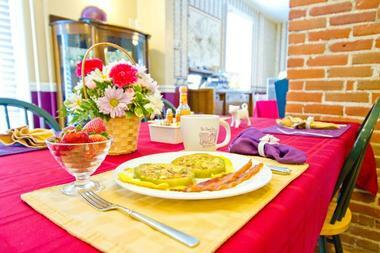 In addition to the luxurious accommodation and delightful décor, the Inn serves a hearty continental breakfast in the cozy dining room. A guest fridge is available to store snacks and drinks and an elegant sitting room, and the library is ideal for relaxing with a book. The Inn has a beautiful garden that attracts a variety of birds. The Dove Inn is located in the heart of Golden, whose main street is lined with a variety of unique shops, fine dining restaurants, cafés, breweries, taverns, galleries, music clubs, and other forms of entertainment. Nestled in the spectacular Clear Creek valley and surrounded by magnificent mountains and mesas, Golden also offers all types of outdoor activities, including hiking, rock climbing, biking, camping, fishing, and a range of water activities such as white water rafting and kayaking.